With Amazon Alexa in the house, you now can issue a voice command to order up whatever music you feel like hearing, all without moving an inch from where you are. Playing music is one of most popular Alexa skills. Use a music service provider. This is a third-party service that supplies you with music, sometimes for a fee. Examples include Amazon Music and Spotify. Use your mobile device music. If your music is stored on a smartphone or tablet, you can stream that music through your Alexa device using a Bluetooth connection. Alexa doesn’t have access to music on its own. Instead, you need to connect Alexa to whatever music provider service you use. The services supported by Alexa depend on where you live, but common providers include Amazon Music, Spotify, and TuneIn. Some music providers require you to have a special type of account or subscription before they’ll let you connect to Alexa. For example, you can only connect Spotify to Alexa if you have a Spotify Premium subscription. In the Alexa app, choose Menu → Settings. The Alexa app displays the Music Services screen, which looks similar to the following figure. If the service you want to use requires permission to allow Alexa to access your account, you see a link to the right of the service. In the figure, for example, you see “Link account on Spotify.com” next to the Spotify service. Tap the link to the right of the service, and then follow the instructions that appear. 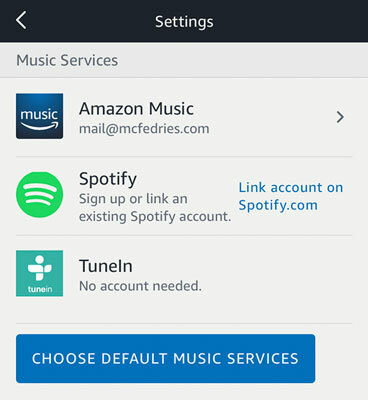 In most cases, you need to log in to your music service and then tap the link or button that authorizes Alexa to access your account. When the link is complete, tap Close (X) in the upper-right corner of the app. The Alexa app displays a notification to let you know that you can use Settings to change the default music provider. If you want to change the default provider, tap the notification’s Go to Settings. An example of the Alexa app’s Music Services screen. When you connect the Alexa app to your Amazon account, you get automatic access to Amazon Music, which Alexa sets up as your default music provider. Here, “default” means that when you ask Alexa to play, for example, a song or an artist, Alexa retrieves that music from the default service. The Alexa app displays the Music Services screen. 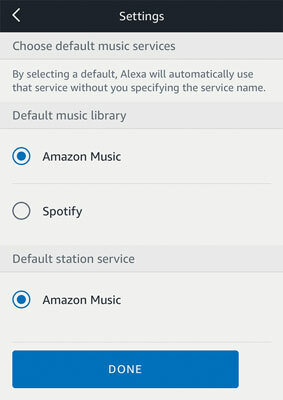 The Alexa app prompts you to choose a default music library and radio station service, as shown in the following figure. Select a music service under the Default Music Library section. Select a music service under the Default Station Service section. The Alexa app updates your music settings. Use the Choose Default Music Services screen to set your music defaults. Okay, now it’s time to get down, get funky, or get wherever you end up when you listen to your favorite music. Alexa has an extremely long list of voice commands for playing and controlling music. Not all these commands will work on all music services. Almost all of them work as advertised on Amazon Music, but your results will vary if you try them with another provider (such as Spotify). Except where noted, all these commands work on the default music service. To run a command on another service that you’ve linked to Alexa, follow the command with “on [service],” where service is the name of the music provider (for example, “on Spotify”). For the mood, you can try just about any mental state, including angry, chill, energetic, feeling good, happy, joyful, laid back, mellow, relaxed, romantic, sad, or upbeat. For the activity, try describing just about anything you’re currently doing, including cleaning, cooking, eating dinner, going to sleep, meditating, partying, reading, relaxing, running, studying, waking up, working, or working out. This feature generally works only on Amazon Music. Also, not every mood, activity, or mood/activity combo works. Alexa tries to match your request with an existing playlist that’s been created by Amazon, and if no such playlist exists — for example, if you ask for “energetic going-to-sleep music” — then Alexa will tell you it can’t find any music to satisfy your request. Install and then start the Amazon Music app. The app asks you to sign in to your Amazon account. Type your Amazon email address (or mobile phone number, if you have a mobile Amazon account), type your Amazon password, and then tap Sign In. If you have two-step authentication turned on, enter the code you were sent and then tap Sign In. Tap the Alexa icon in the bottom toolbar. The first time you access Alexa, the app asks your permission to use your mobile device’s microphone. The Amazon Music app is now ready to accept voice commands. Either say, “Alexa,” or tap the Alexa icon, and then say your command. Tap the Menu icon (the three vertical dots) in the upper-right corner of the Amazon Music app. Tap Connect to a Device. 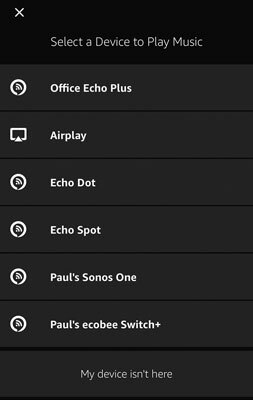 The Amazon Music app displays a list of available devices, which includes any Alexa devices on your network, as shown. Tap the Alexa device you want to use for playback. Your Amazon Music content now plays through your Alexa device. Use the Select a Device to Play Music screen to play Amazon Music through an Alexa device. The downside to playing your Amazon Music selections through an Alexa device is that you forgo the ability to use Alexa in the Amazon Music app. To get Alexa back on the job in the Amazon Music app, you must disconnect from the Alexa device. To do that, choose Menu→ Connect to a Device, and then tap the Disconnect button next to your Alexa device. If you have a third-party music provider linked to Alexa, you normally ask Alexa to play music from that provider either by specifying the provider name in the voice command (for example, “Alexa, play the Chill playlist on Spotify”) or by setting up that provider as the default. However, there’s a third method available: You can use the music provider’s app to select your Alexa device as the playback device. For example, in the Spotify app, if you choose Settings → Devices→Devices Menu, you see the Connect to a Device screen, which offers a list of available devices that you can use for playback. This list will look similar to the one shown here, which you can see contains a couple of Echo devices and a Sonos speaker. Tap the Alexa device you want to use and then any music you crank up in the app will play through your Alexa device. 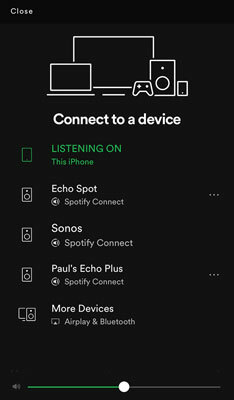 The Spotify app’s Connect to a Device screen, which in this example contains several devices that can be used for playback. Bass: This component controls the lowest tones in the music. Treble: This component controls the highest tones in the music. Midrange: This component controls all tones in the music that lie between the bass and treble tones. If you happen to have the Alexa app open, you can also use it to make equalizer adjustments. Choose Devices →Echo & Alexa, tap the Echo device you want to adjust, and then choose Sounds→ Equalizer. Use the Bass, Mid, and Treble sliders to adjust the settings as needed. If you have an Echo Show or Echo Spot, you can mess up, er, sorry, mess around with the sound quality by opening Settings and then choosing Sounds→Equalizer. Use the Bass, Mid, and Treble sliders to adjust the settings to taste.